As adults we sometimes forget how to play, or maybe you never played as a child and so playing with your own children is a bit of a mystery. Alternatively, you may remember times when you played all day long and entered into worlds that were full of adventure and fun. Play is a broad term, and within play there are many types of play. For example, gross motor play or active play is play using the whole body (or large muscles) and you can see this type of play when children jump, run, roll, skip, climb, throw balls etc. Fine motor play is activities using your hands such as; threading, drawing, cutting, and turning pages of a book. Other types of play are: sensory play (eg, play with sand, water, mud), visual perceptual play (eg, playing with puzzles, mazes, card games) and auditory play (eg, listening games, I spy) and pretend play (eg, dressing up, creating play scenes). All types of play are important for a child’s development because through play children develop muscle strength and coordination, manipulation skills, looking and listening skills, and thinking skills. As children enjoy playing they also feel good about themselves and learn about their world. Pretend play (also called imaginative play, make-believe play, imaginative and symbolic play) is the focus of this website because pretend play is the mature form of play and becomes more noticeable as children develop. There are many ways to describe pretend play. Essentially pretend play occurs when children imagine something. That is, they impose a meaning on what they are doing that is beyond what can be seen. For example, they might be feeding a teddy bear, but the teddy bear is sick and needs a doctor; or they might be pushing a truck in the sand pit, but the truck gets a flat tyre and runs out of petrol; or they might be sitting in a box with a stick, but the box is a boat and the stick is a fishing line and they have just caught the biggest fish they have ever seen! 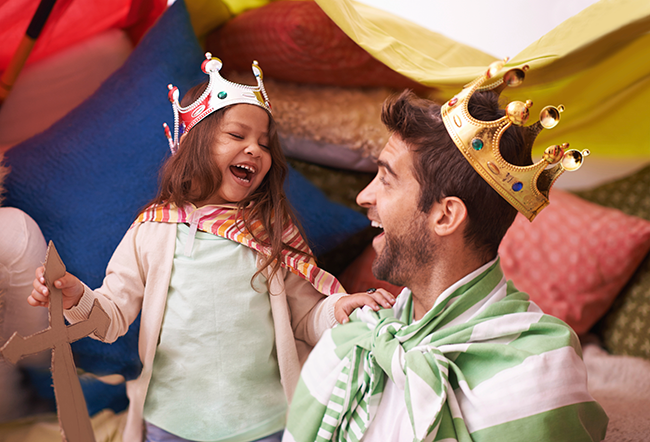 Within all the different types of play, pretend play is unique because there are three key thinking skills that children use when they pretend in play. 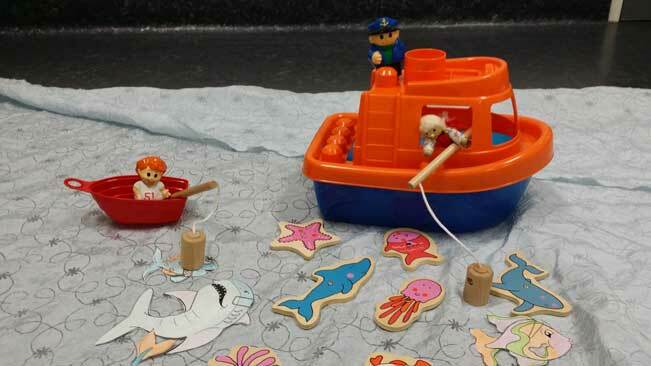 These are: 1) children use objects as something else, like the box for a boat; 2) they attribute properties to objects like the teddy being ‘sick’; and 3) they pretend objects are there when they are not, such as the big fish or the petrol. Pretending in play is about imposing meaning and going beyond the literal. Even having a cup of tea with a small child is pretend play when you are pretending to drink from an empty cup or blowing on the empty cup because the tea is ‘hot’. 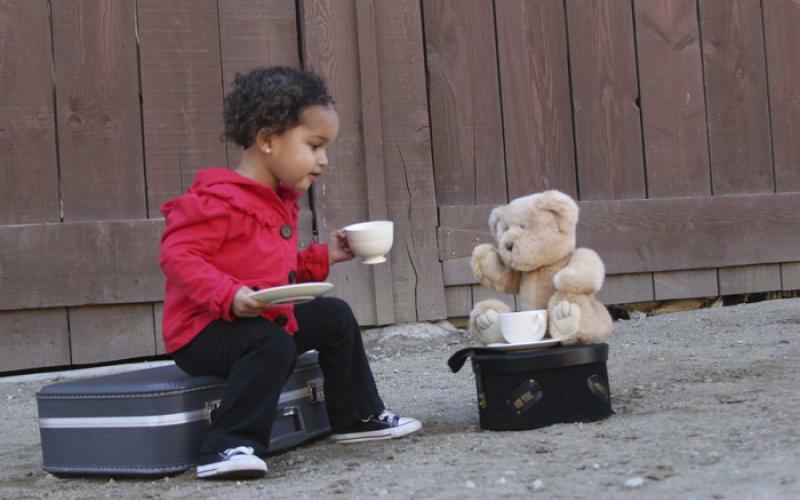 Pretend play also includes play scenarios where children take on roles and pretend to be someone else, or pretend an object is real (such as a teddy being alive). Pretend play is linked with language development, narrative language, abstract thought, logical sequential thought, creation of stories, social competence with peers, self-regulation, social and emotional well-being, creativity, and the ability to play with others in the role of ‘player’. The ability to pretend in play is about understanding the meaning of what is happening beyond the literal function of toys. It is ‘thinking play’. Pretend play can be imposed on other types of play. For example, when children are running around (gross motor play) they might also be pretending they are running in the Olympics or being chased by a crocodile. For example, in visual perceptual play they may start moving the puzzle pieces around in the air because the picture on the puzzle piece shows a person walking, so they move the puzzle piece as if the person is walking. For example, in fine motor play, they may be threading a necklace but the ultimate goal of making the necklace is for the princess in the play scenario to wear it. While there is always debate in the research literature about how important pretend play is to children’s development, children who cannot pretend in play or don’t develop the ability to engage in pretend play most often require some form of intervention at some point in their lives. Pretend play develops from simple to complex levels of ability and in a developmental sequence in the typical development of children. As a framework to understand the development of pretend play and to observe pretend play in children, I developed the Symbolic and Imaginative Play Developmental Checklist (SIP-DC). This is available in the book called; Learn to Play: a practical program to develop imaginative play skills. Play scripts: Play scripts are the stories that children make up in their play. When children begin to pretend in play, the play scripts they make up reflect their domestic life. You might see children pretend to talk on the phone, have a cup of tea, make a cake, or give their doll or teddy something to eat. As children develop they include fantasy stories which may include their favourite movie or storybook characters. By 5 years, children can make up any story in play. They can invent fictional stories, real stories from their own lives, and they may have adventures and go to places in their play that they totally create. Sequences of play actions: To play in an organised way, children need to be able to sequence their play actions logically. If they don’t sequence their play actions logically, the play looks unorganised. By 2 years of age, children have short, simple, logical sequences in their play. A logical sequence of play actions would be to stir the cup, give a drink to the teddy by lifting the cup to the teddy’s mouth, and then telling the teddy it has had enough. Another logical sequence could be putting blocks in the truck, pushing the truck and taking out the blocks. By 4 years of age, children can carry out numerous action sequences to the extent that a play scenario can be developed over 2 – 3 days, and by 5 years of age, children can develop ideas in play over 2 – 3 weeks. Object Substitution: Object substitution occurs when a child uses an object for something else. For example, they use a block as a mobile phone or a box as a bed for the teddy. When children begin to develop this skill, they use objects that are physically very similar looking to the object they are intending. A common example in Australia is when children use the TV remote and pretend it is a mobile phone. By 4 years of age, children can use any object as anything. The object doesn’t have to look like anything like what it represents. An example of this is using a teddy bear as an aeroplane. Social Interaction: Pretend play ability overlaps with social competence as children play with peers. This is called social pretend play. Children begin by watching and imitating others. By 3 years of age, children engage in lots of talking when they play beside and with others. At this age they are not ready to negotiate with peers and so in early childhood setting you will observe that 3 year olds tend to have their own equipment. By 4 years of age, negotiation and cooperation with peers becomes more of a feature of play when children are socially interacting in play. By this age, you might observe them negotiating with a peer to have a turn on a bike or have a go with the spade digging in the sandpit. Role play: Role play by 4 and 5 years of age is clearly seen when children pretend they are a mother, shopkeeper, policeperson, astronaut etc. 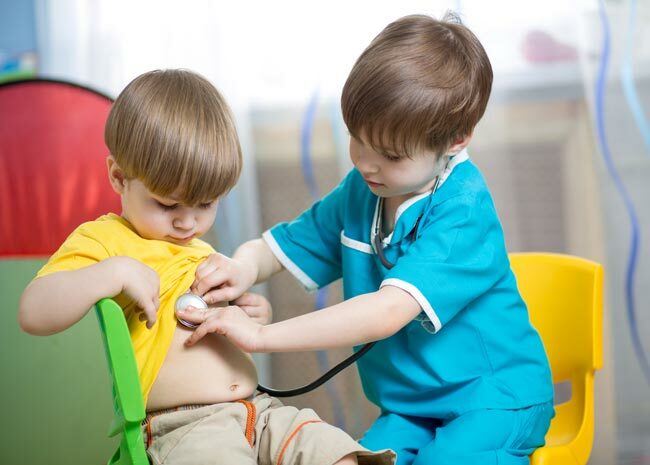 Role play is one of the more complex play skills because to be able to copy what someone else does, and to carry this out over a few days requires the child to have a good idea of what that person will say, how they will behave, what they believe and what their motivation is. For example, a shopkeeper’s motivation is to sell goods and a customer’s motivation is to choose which good to buy. Before 4 or 5 years of age, children are imitating others and copying what they have seen other people do. Before the age of 4 years, they usually don’t spend a lot of time copying others but they may imitate different people over a day or throughout a week. 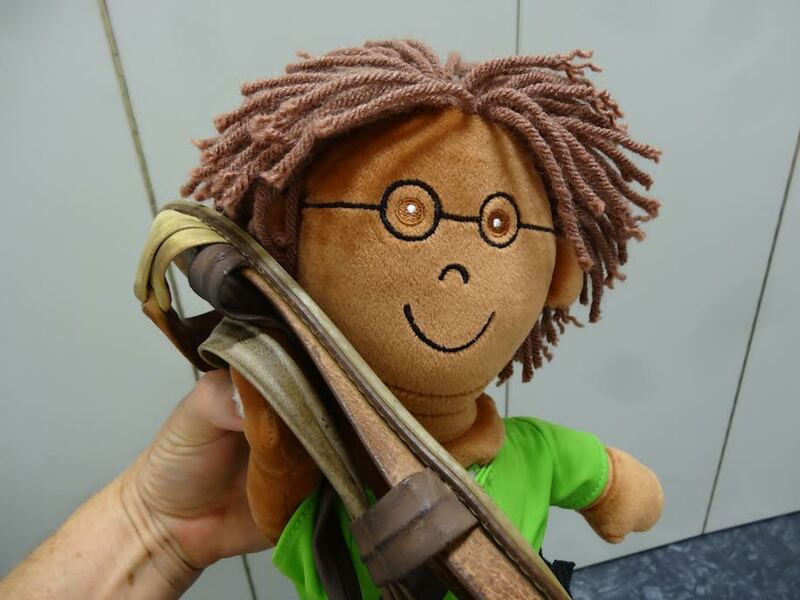 Doll or Teddy play: When children pretend in play, you may have observed them playing with a doll or teddy [or some character] and interacting with this character as if it is alive and talking back to them. This ability is also termed ‘decentration’. That is, the child is able to step back and work out what the teddy or doll is saying or feeling and respond to the doll or teddy. When children show this skill in play, they are demonstrating the ability to understand the point of view of others. 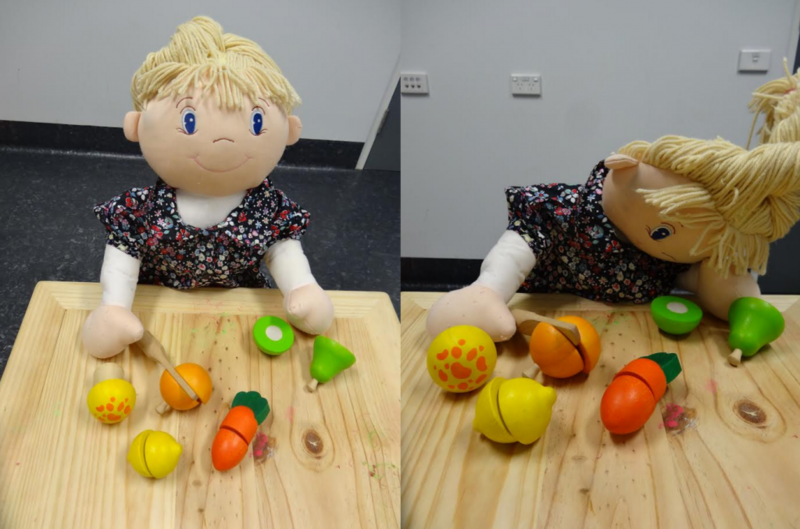 Most often in play, the doll or teddy are not feeling what the child is feeling ,or the doll or teddy are thinking different things to the child and the child is responding to them. For example, the child might be trying to feed the teddy but the teddy isn’t hungry and won’t eat. The doll or teddy really is alive to the child. Children begin to pretend in their second year of life. Pretend play continues until about the age of 10 or 12 years, when their dolls and teddies stop talking to them and return to just being toys. At this age they pack up their toys and play changes.